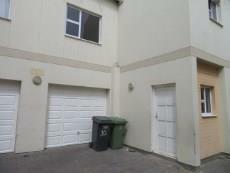 Beautiful, Spacious 2 Level Townhouse close to the Centre of Town. 3 Bedrooms, 2 Bathrooms, Fitted Kitchen, Open plan Living with a Single Garage and Private Courtyard. Bathroom 1 Full Bathroom with fitted Shower and Bathtub. 1 Bathroom with fitted Shower. Kitchen Fitted Kitchen Open Plan. Lots of Storage space.